Are you looking for a distraction free way to display online forms on your WordPress website? Creating a dedicated form landing page in WordPress is a great way to save time, generate more leads, and boost form conversions. 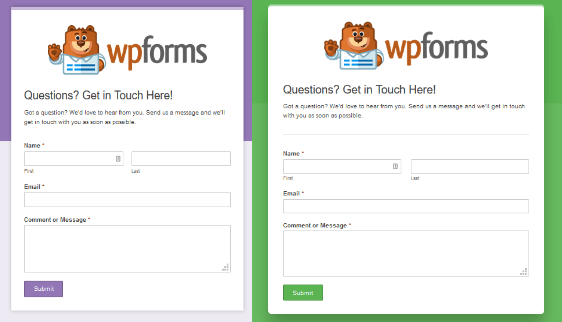 In this article, we’ll show you how to create dedicated form landing pages in WordPress using WPForms. What Are the Benefits of a Form Landing Page? Having a custom form landing page has many benefits. Not to be confused with a standalone webpage, a form landing page is a page your site visitors land on from either internal or external links. Increase Conversions: A lot of times people don’t finish filling out online forms because there are too many distractions. Multiple offers pull site visitors away from subscribing to your email list. But if there is nothing on the page except your online form, people are more likely to sign up. Spread Brand Awareness: Since WPForms lets you create a custom form landing page, complete with a company logo and customized color schemes, you build more brand awareness and recognition among site visitors, which in turn will help you grow your small business. Better Customization: When you have a dedicated landing page, you are in control of customizing how it looks. This is much different than traditional web form layouts, which are controlled by your WordPress theme and may prevent you from customizing your form the way you want. No Need for Separate Webpages: There will be times when you have a form for people to fill out, but don’t want to create an entirely separate WordPress page that shows up in your navigation menu. With a dedicated form landing page, you create a custom landing page with your form on it, without having to build separate webpages. Whether your main goal is lead generation, creating a membership site, giving people an easy way to RSVP to events, or gauging customer loyalty with survey forms, creating a distraction free landing page for your online forms is a great idea. Now, let’s see how to create a dedicated landing form page in WordPress. 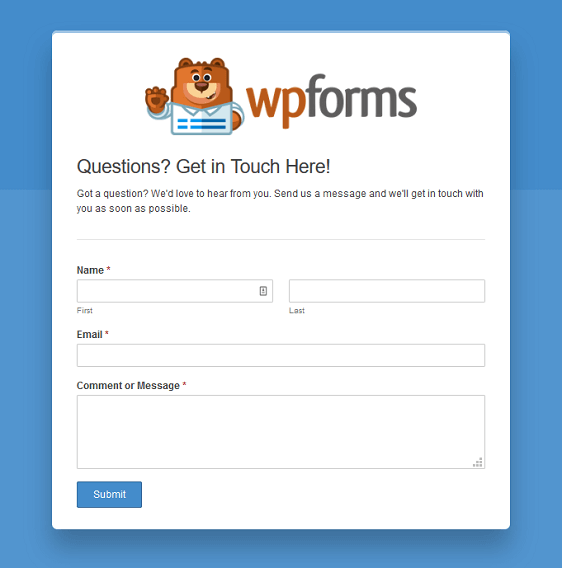 You can create any number of online forms using WPForms and the Form Templates Pack addon. For our example, we’ll create a simple contact form. For help with how to do this, check out this easy to follow tutorial on creating a simple contact form in WordPress. 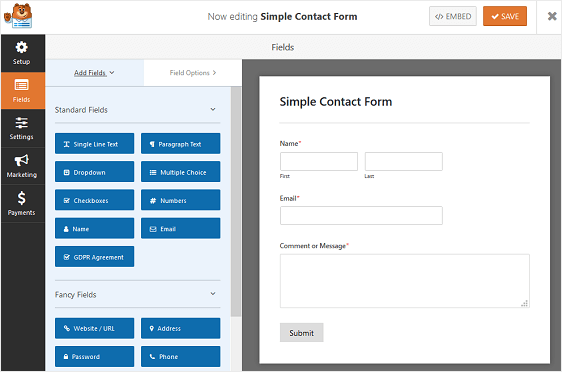 If you want to see the simple contact form template in action, head over and check out our simple contact form form demo. Then, click on the field to make any changes. You can also click on a form field and drag it to rearrange the order on your online form. Just remember, no matter which type of online form you create, you can turn it into a dedicated form landing page. Once your WordPress form is ready, you’ll need to install and activate the WPForms Form Pages addon. This addon is how you’ll be able to turn your newly created WordPress form into a custom form landing page. To start, go to WPForms » Addons and find the one labeled Form Pages Addon. The Form Pages addon is now ready to use. But first, let’s take a quick look at the general form settings you should configure before creating your custom form landing page. There are many settings to configure once you’ve customized your form to look the way you want it to. Here you can change things like your form’s name, description, and submit button copy. You can also enable additional spam prevention features to keep your website secure from unwanted form submissions. Unless you disable this feature, whenever someone submits a form on your site, you’ll get a notification about it. 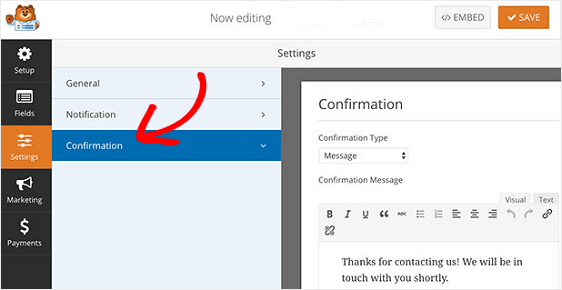 If you need to send more than one notification, for example to yourself, a team member, and your site visitor, check out our step by step tutorial on how to send multiple form notifications in WordPress. 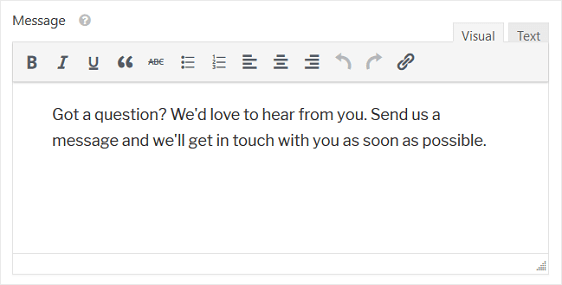 In addition, if you want to keep branding across your emails consistent, you can check out this guide on adding a custom header to your email template. 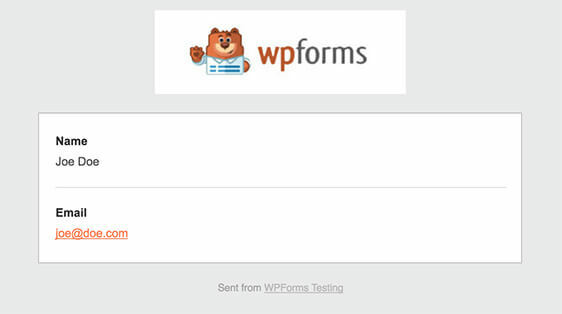 Form confirmations are messages that display to site visitors once they submit a form on your website. They let people know that their form has been processed and offer you the chance to let them know what the next steps are. Message. A simple message that displays once someone submits a form on your website thanking them and letting them know what the next steps are. Show Page. Redirects users to another page on your website, such as a thank you page. Go to URL (Redirect). Sends site visitors to a different website. 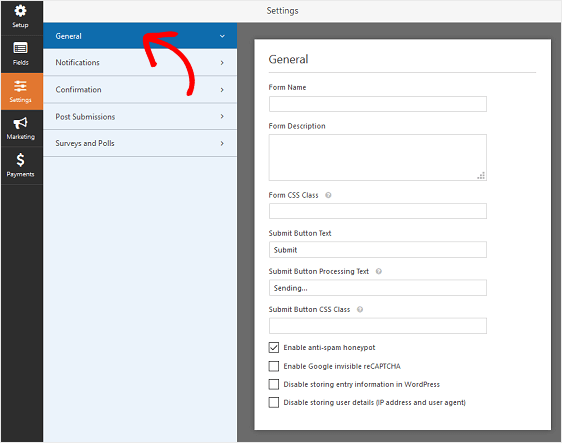 Now that you have your form’s general settings configured it’s time to configure your form landing page settings. To do this, go to Settings » Form Pages in the form builder and click on the Enable Form Page Mode checkbox. When you do this, you’ll see a bunch of settings that you can customize. To start, give your form a title that will display for your site visitors. This is good for letting people know what your landing page is all about. It also lets them know what action you want them to take while there. Next, you can add a short message for your site visitors to see. This gives you a chance to add some additional information so people know what to expect when they fill out your form. Whenever you enable form page mode, the Form Pages addon automatically creates a unique permalink for you. You can change this permalink if you want, or leave it. This is the URL you’ll use in email campaigns, internal linking, and even social media posts when you want people to visit your custom form landing page and convert. The next thing you can do to customize your dedicated form landing page is add a logo. Click on Upload Image and choose the image you want to add to your form landing page. You have the option of adding some footer text to the bottom of your form landing page. Change the default text by either deleting it and leaving it blank, or adding your own text. You can also remove any WPForms branding by clicking the Hide WPForms Branding checkbox. One of the best things about the WPForms Form Pages addon is that you can customize your form landing page to have a color scheme that matches your company’s branding. The color scheme you choose will determine the color of the your form landing page background and the form’s submit button. To make things easy on you, we’ve given you several great color schemes to choose from that we know will look good no matter what. If you don’t like any of the pre-set colors, you can use the color picker and choose a custom color. Classic Design: displays a narrower form with square corners. The lower portion of your page’s background will be lighter than the color you choose for your color scheme. Modern Design: displays a wider form with rounded corners. The lower portion of your page’s background will be darker than the color use choose for your color scheme. Once you’ve configured all your custom form landing page’s settings, you can click the Preview Form Page button near the top to see how your form will look once it’s live. When everything is how you want it to be, click Save. And that’s it! Your form has now been turned into a dedicated form landing page. When people have the URL or a link to your form landing page, they’ll be able to view it and fill it out. If you’re looking for ways to build your online forms so they have a better chance of converting, check out this roundup of 10 simple ways to design your forms and boost conversions. Thank you for this article. I was wondering, if you are creating a website in completely private mode, will this affect your ability to embed a form as content in different places on the web page? Creating a website in private mode shouldn’t affect your ability to embed a form on the site overall so there might be another issue that is causing an issue. If you have a paid license, please feel free to contact our support team and they can follow up with you regarding this problem.